available for handicap parking stall mats. 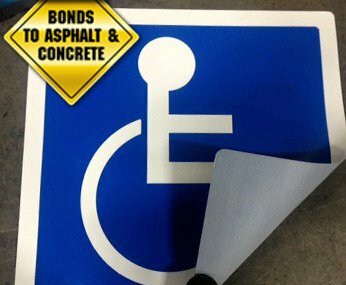 POWERBOND is the ADA approved parking stall mat that is both easy and quick to install. Due to its proprietary peel ‘n stick technology, the mats take just minutes to install and require no special tools. With POWERBOND, there is NO painting, NO drilling, NO anchoring and NO extended traffic lane closures. The adhesive used in the POWERBOND parking stall mats is ultra-strong, heavy-duty and long-lasting. It is secure and fast and will stick to both asphalt and concrete. Space-aged technology makes the mat weather, UV, water and temperature-resistant. Save time and money when it comes to installation. POWERBOND is easily installed by just one person with minimal preparation required. If you are currently sending out a crew to paint and mark handicap parking spots, let us save you time and money. Start lowering your labor costs today with the easy to install POWERBOND ADA accessible, handicap parking stall mat.